The first Danilewsky airship: The "Embryo"
This very fine, detailed photograph was taken in October, 1897 in what is today Kharkiv, Urkaine. It is Danilewsky's first of four airship designs, developed with the goal of methodically uncovering the many nuances of flight at a time when human flight was still on the distant horizon. Danilewsky received a patent for this design on October 22, 1897. This was, for me, in all my years of airship research, a terrific and rich discovery! In the late 1800's, when Zeppelin was beginning his work in Germany, and Santos-Dumont had not yet built his first airship, a man by the name of Konstantin Danilewsky, (b. 1857, d. (? )), a physician from Kharkiv (then Kharkov, Russian Empire), had already patented his ideas for an airship powered by a human! This was nearly a decade before Alva Reynolds or Thomas Baldwin in the United States both tested and flew their own man-powered dirigibles: See Man Angel on this site. Konstantin Danilewsky built and tested 4 airships in the years just preceding 1900. His log-book documents, during the years 1897–1899 nearly 200 ascents, and unlike many pioneers of aviation in this era, exactly the same number of safe landings! In the sections which follow, I will illustrate each one of these airships as best as I can, given that the great majority of historical information about the Danilewsky work is in Russian or German. Please note, I have endeavored to include an acknowledgments section at the end of this article. I am most grateful for the help I received. 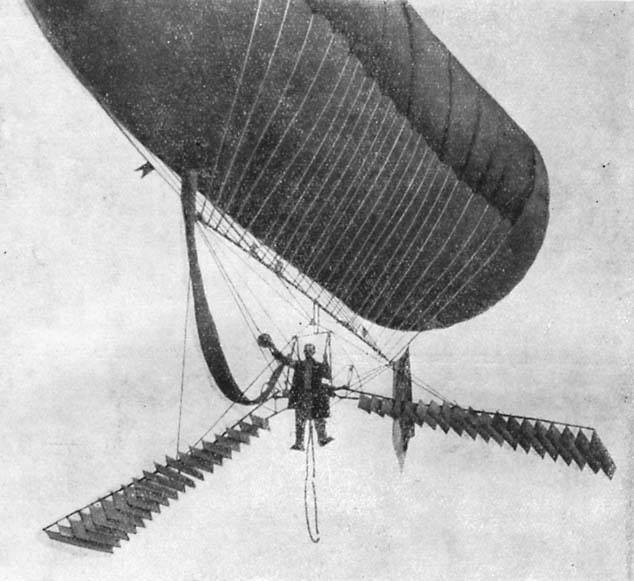 "When I was still a student, I frequently thought that it would be very simple and easy to arrange a flying apparatus so that at the command of the aeronaut (he could) ascend into the air, descend, or stop and motionless in the air and generally maneuver; and all this can be done as many times as necessary without discarding any ballast and without releasing the (lifting) gas. To do this, you just need to lighten the weight of a person with a hydrogen balloon; but not completely - rather to leave some of its weight with an unbalanced balloon, and now the man himself will raise the remaining weight by his work on his wings: when he works, the apparatus rises into the air; will he ceases to work - it will lower." Danilewsky's 1900 book in Russian, German, and English. Danilewsky's 1900 book, about 88 pages, was written at the end of a brief period of experimentation and is filled with insight and discovery presenting the culmination of his three years of work from 1887-1899. It was published in Russian and German at that time. The work was largely lost to history with the rapid progress in aviation in the early 1900's. 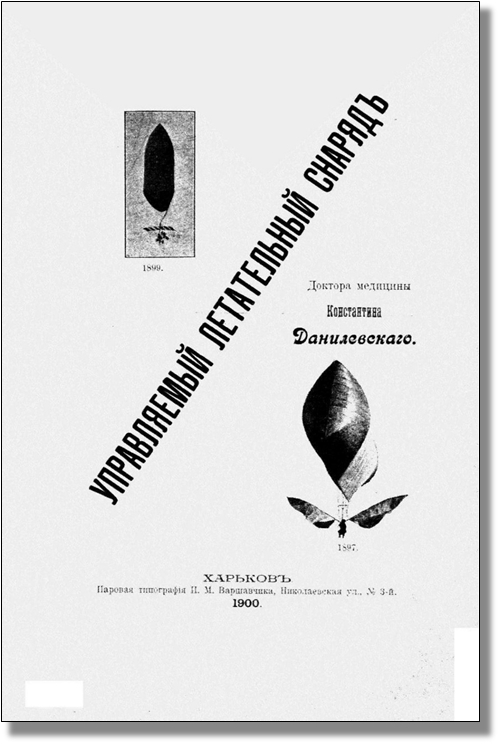 Danilewsky's magnificent work faded, quite unnoticed until, by chance a copy of the book in Russian was found by Dr. Alexander Akimov, Ukraine, whose vision to re-publish the work led to this work "AirBike...1897", where for the first time the lost book is rendered in English. 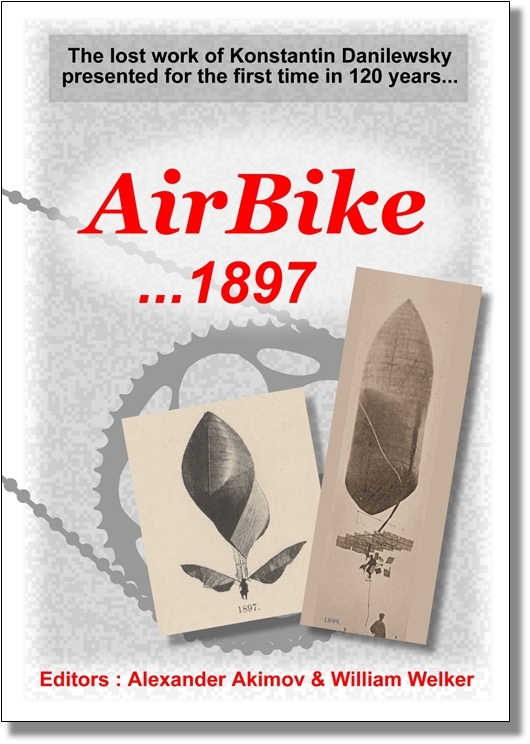 (The cover page image above is linked to the book "AirBike...1897", hosted at airbike.welweb.org). All students of aviation history are encouraged to spend some time with this newly available resource. 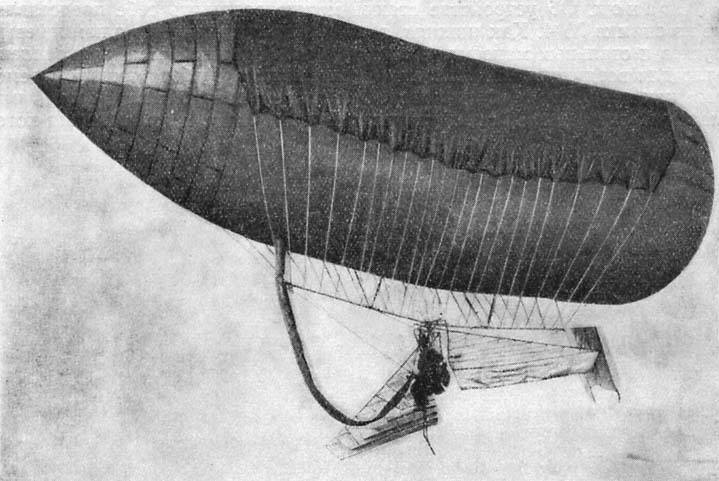 Danilewsky's idea was that he would build an airship, not quite buoyant, which would offset the weight of the airship itself and most of the weight of the pilot. The pilot then, using his own muscle-power would become the "engine", operating the propulsive mechanism, in this case "oars" (or "wings") instead of a propeller driven by a petroleum engine. But Danilewsky repeatedly set aside his vision, putting it in a "box", he writes, resulting in years of simply thinking about his idea from time to time. Danilewsky states: "Sometimes, you take the idea out of the box, and you admire it and again carefully hide it - in the same box. And so it dragged on for many years." It's a bit hard to imagine the "model" of "20 meters long and 13 meters wide" as those dimensions are larger than anything Danilewsky ever built! Presumably the model was sub-scale, perhaps 2 meters by 1.3 meters (about 6 x 4 feet), so he could illustrate his concept to interested parties in search of funding. Danilewsky writes: "...she obediently flew in all directions at will; many people saw it; but there was not an investor among them to go with me on a voyage on the waves of chance and risk." (Here Danilewsky aptly describes his need for a benefactor to support the cost of building and testing a full-scale airship.) The model was evidently large enough to fill with hydrogen and likely conducted only tethered flights. Finding no investor, Danilewsky once again "shelved" his idea in the box until 1897. Anyone encountering the historical record of the Danilewsky airships will quickly discover confusion as to which of the four Danilewsky airships is which! This is similar to the confusion as to the identity of the American Reynolds and Baldwin airships (see Man Angel). Curiously, though misidentification of airships is not infrequent, (it happens quite a lot! ), it is interesting to note that the link here between the airships of Danilewsky, Reynolds, and Baldwin is that they are all "man-powered" airships! Danilewsky No. 1, the "Embryo"
Figure 3. Photo credit: Public domain. From Danilewsky's book, page 6. Other than Figure 1, above, the only other photos of the Embryo found during my research were in Danilewsky's 1900 book. 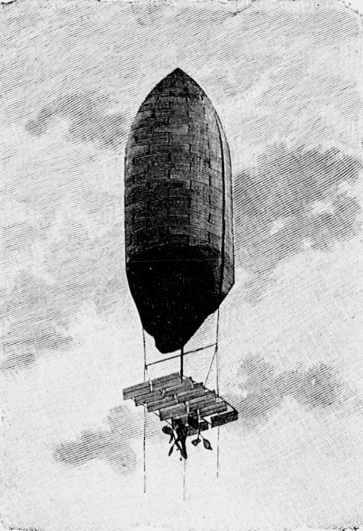 It is Danilewsky's first airship and its design is remarkably close to the drawing of his idea in his 1897 patent (see Figure 4). Operating dates: 8 October 1897. (Some 25 ascents made according to the Dec 31, 1898 issue of Scientific American magazine). Visual: Visual: Elongated envelope, rounded stern and a cruciform shaped bow, and a single spar which acts as a keel. A "blanket", supporting ropes, surrounds the envelope and descends to attach to the keel spar. A frame basket is suspended from the middle of the keel to support a single pilot. "Wings" extend from the pilot's basket which are operated by the pilot using his feet to "wave" the wings up and down. The pilot and basket can "tilt forward" thus changing the angle of attack of the wings such that horizontal propulsion was possible. Danilewsky's idea, remember, was that if an airship could be just the right size to compensate for not only its weight but also almost all the weight of the pilot, then the pilot could act as the "engine" using his own muscle power to provide propulsion. In Danilewsky's time, light-weight gasoline engines were not yet available, and though Danilewsky recognized the obvious benefit of using a gasoline engine, he sought to solve the problem of flight in a practical, step-by-step manner such that when the light-weight gasoline engine inevitably became available, it would be a simple matter to outfit the craft with a mechanical engine. Figure 4. Drawings from Danilewsky's 1897 patent. Photo credit: Public domain. Not much is known about flight tests of the Embryo. It can be speculated that flights of the Embryo were not encouraging. The "nose" of the envelope was, according to Danilewsky's patent, intended to be far more "pointed" (i.e. a steeply shaped "V"), to reduce air resistance as the craft was propelled forward. (Daniliewsky was keenly aware of and sought to reduce air resistance as much as possible.) As can be seen in this photo of the Embryo, the builder of the hydrogen envelope did not provide the desired, steep "V" shape of the nose! Additionally, the method of attaching the keel to the gas-envelope using a blanket wrapped around the gas-envelope no doubt proved "heavy". Indeed, the craft could not lift Danilewsky, who had intended to fly it himself. Danilwesky arranged for a young mechanic named Peter Kosiakov to fly the craft for him. Young Mr. Kosiakov went on to fly all four of Danilewsky's brilliant airships! Given the late date of the first flight of the Embryo (Oct, 1897), and its likely disappointing performance, it would not be beyond reason to ague that the Embryo's only flights were that day! Danilewky writes in his book that he barely got the Embryo's envelope filled with hydrogen before his hydrogen generation plant "collapsed". He concludes "The experience was a success; and we made a series of tethered and free lifts into the air and descents." Regarding the Embryo's performance, Danilewsky writes: "I will not speak here of the shortcomings of my first apparatus-for there are thousands of them: this apparatus was the essence of maladroitness; but at that time, in the air, she seemed to me a wonderful winged Pegasus." But the Embryo was too heavy and maneuverability was clearly a problem. The oars were heavy and cumbersome and required redesign to be lighter and more responsive. Dr. Danilewsky no doubt had ideas for the next version of his dream! Danilewsky No. 2, the "Pilström"
Sometimes written in English as the "Pilstrom" or "Pilstrem", it is named after Danilewsky's benefactor Andrei Andreevich Pilström who provided funding for Danilewsky's experiments until he died suddenly (sometime in early to mid 1900(?)). Operating dates: 1st ascent, 18 Jun 1898. Numerous ascents - up to 150 conducted - through the summer of 1898. Visual: Elongated envelope, sharply pointed bow while very rounded at the stern, projectile or bullet shaped. A single spar acts as a keel. The "blanket" of the Embryo has been replaced with a lighter "netting" over the envelope from which lines (lanyards) around the envelope descend to attach to the keel spar. Like the Embryo, a basket is suspended from the middle of the keel to support a single pilot. Various photos of the Pilström show not only that many types of "oar" designs were tested, but the airship itself seemingly was constantly modified. (See additional photos, below). The Pilström was the "workhorse" of Danilewsky's ideas. Reported to have had at least 150 ascents in the summer of 1898, Danilewsky had the opportunity to evaluate oar shapes, oar operation, the most advantageous mounting point for the oars (high or low - at the pilot's shoulder level or at his waste), the securing of the pilot's sling, and the conduct of flight: ascent, descent, turns, capability against the wind, etc. Longitudinal instability in an airship is encountered when the hydrogen contracts thus reducing pressure in the envelope and causing the envelope to "slacken". The resulting slack permits the envelope to become flexible and the hydrogen then, gathers at whichever end of the airship's envelope happens to be the path of least resistance for the hydrogen to find a "high point". That pooling or gathering of hydrogen at one end of the gas envelope, of course, causes greater lift at that end, and the axis (pitch) of the airship is affected. Say the airship has pitched down since the hydrogen gathered aft. If the pilot applies power to the engine to "force" the airship to return to level, the hydrogen simply flows forward in the slackened envelope, consequently shifting the lift at the nose, and the airship begins to pitch too high. This is the instability. 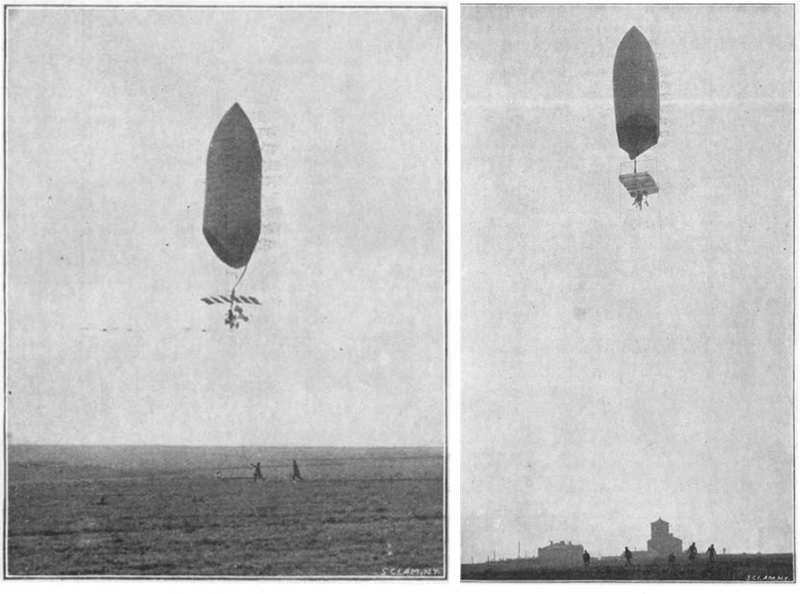 Non-rigid airship designers solved the problem with an internal "ballonette" - a separate balloon inside the hydrogen-filled envelope - which could be pressurized with air to maintain the interior pressure of the envelope so the envelope never "slackened" and the hydrogen never "pooled" at one end or the other. Danilewsky wrote that he was unable to learn how others handled the problem of longitudinal instability. He therefore solved the problem himself! His innovative solution was to install a series of transverse silk partitions inside the gas cylinder, making it difficult to transfuse the gas from one end to the other. As the hydrogen expands or contracts as it heats or cools, the gas is constrained within the envelope by these partitions so that large volumes of hydrogen could not "suddenly" migrate from one end to the other when the overall pressure in the envelope was reduced. Danilewsky's solution was brilliant, for he did not have a petroleum engine, driving a propeller which, in turn, provided the air to pressurize an internal ballonette! Available photos of the Pilström hint at the many external changes made as Danilewsky put the craft through its many tests. Here are a few photos to illustrate. The photos are in no particular order because it is impossible to accurately assess the dates of the individual photos so as to present the photos in order. Danilewsky No. 3, the "Orichka"
The Orichka is a bit of a mystery. 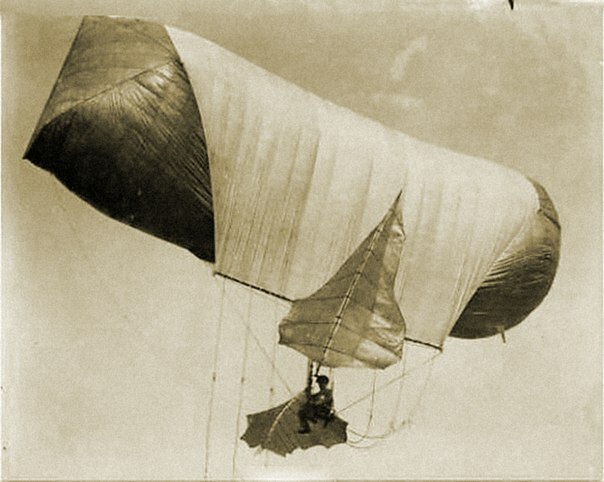 Since flights of the Pilström took place throughout the summer of 1898, beginning in mid June, and the only known flights of the Orichka took place on 5 & 6 August of the same summer, it is reasonable to assume that the envelopes for both crafts were procured from Lachambra in Paris in the same purchase order. The gas-bag/envelope (Danilewsky simply calls it "the balloon") for the Orichka appears to be the same design as the Pilström, and was reported to be about the same volume, but the Orichka was longer (by about 12 feet (3 meters)) than the Pilström, and would necessarily need to be somewhat smaller in diameter than the Pilström to contain the same volume. There are few photos of the Orichka which can be decidedly determined to be the Orichka and which are not mistaken as the Pilström. The absence of photos and the only known flight dates of 5 & 6 August suggest not many flight tests were conducted which suggests Danilewsky was somehow not satisfied with the performance of the Orichka. Figure 10. Photo credit: Public domain. Visual: Similar appearance to the Pilström, but a noticeably longer hydrogen envelope and keel-spar. If I may be permitted to speculate: The Pilström and the Orichka are reported to have been "about the same volume" but the Orichka was longer by about 12 feet (3 meters). What would Danilewsky have been thinking? Since he likely ordered the envelope for the Pilström and the Orichka at the same time, the difference in the envelopes most decidedly was not due to experimental results! Rather, Danilewsky might have had some doubts about the best shape of the envelope, against which he was hedging his bets. If one design worked well, all is good. But if one does not work, there is the other! My guess is that Danilewsky was not comfortable with his computations and estimations of just what length-to-diameter ratio would function the best for an airship powered by his human engine. Perhaps he had doubts that his solution for longitudinal stability would work? Perhaps it was his concern about air resistance that led him to two different envelope designs. Whatever the reason, we may never know because Danilewsky did not write about the successes or shortcomings of the Orichka over the Pilström. Danilewsky No. 4, the unnamed variation simply called the "1899" version. Danilewsky long thought about the best solution to overcome air resistance of the envelope during ascent. Most of the pilot's energy was expended ascending. You get sense that Danilewsky was most troubled by the effort it took for his pilot (the human-engine) to overcome that unforgiving resistance to climbing. Also concerned about longitudinal stability, he fully recognized that a vertically oriented balloon would go a long way to solving both problems! The pointed end of a vertical balloon would produce far less air resistance during ascent, and the vertical orientation of the balloon would have absolutely no longitudinal instability! 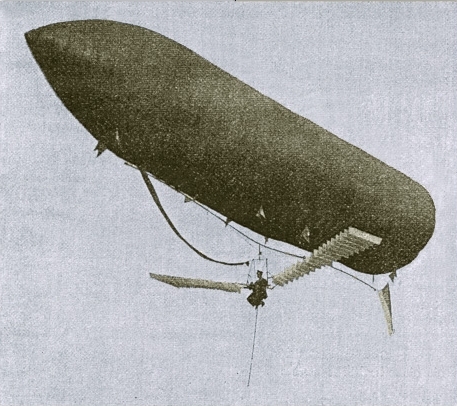 An entirely new airship design was planned for the 1899 tests, including a radical new balloon which, oriented vertically, would also be steeply pointed at both ends. A plane-surface (in those days called an "airplane", remember, in the late 1800's what we know today a the "airplane" did not exist) which would act as a "parachute" to control both decent and horizontal displacement. Figure 11. Photo credit: "La Navigation Aérienne-Histoire documentaire et anecdotique". Public domain. Operating dates: Late September and October 1899. About 40 ascensions before weather prevented any further testing. Visual: An envelope is positioned vertically (unique to Danilewsky). In the design, both ends of the envelope are pointed. Instead, the envelope procured from the Lachambre brothers in Paris had construction flaws which needed correcting before use. Lacking time for 1899 experiments, Danilewsky instead employed the envelope for the Pilström from 1898 for this season's experiments. Underneath the envelope was a rectangular "frame" (the "airplane", refer to the photo above) with louvers which could be opened or closed as needed to assist ascent or inhibit descent. A twin set of 4-bladed paddle propellers were situated on the left and right and slightly behind the pilot which could be oriented to provide desired propulsion up, down, left, or right. As mentioned in the "Visual" specification, above, the "airplane" suspended below the balloon was designed with "louvers" which could be controlled by the pilot to be "closed", "open" or set to any angle in-between. Open, the louvers permitted free-flow of air through the airplane offering the least resistance. Closed, the louvers created a resistive surface, such as that of a parachute, against air flow. The louvers positioned instead at an angle, caused the direction of airflow through the airplane to be displaced as the craft ascended or descended, thereby imparting a slight horizontal displacement which could be controlled by the pilot. Figure 12. Photo credit: Scientific American Jan 20, 1900, pg 43. Public domain. 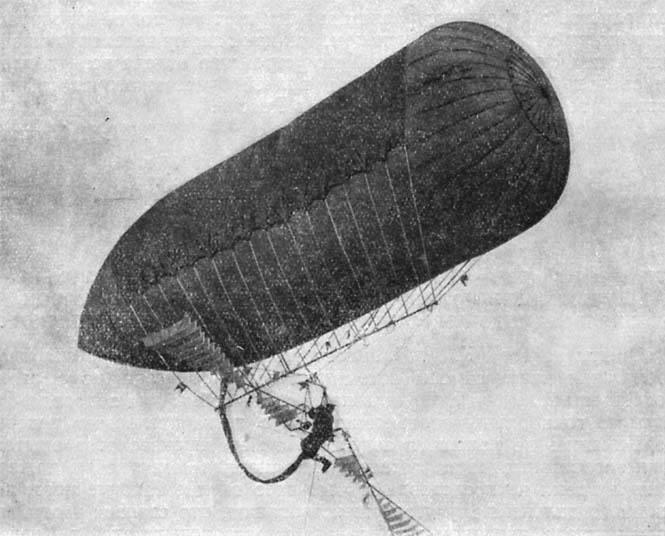 The pilot sat in a "trapeze" or "sling" suspended from sides of the balloon and the airplane. Not only could the pilot control the position of the airplane louvers, but he had a dual set of propellers on either side, slightly behind him, that he could activate using his leg power like a bicycle. The pilot could, through an ingenuous coupling mechanism, set the propellers to force air "down" or "up", thus ascending or, when descending, add to the speed of the descent. Even with a balloon which did not meet Danilewsky's design goal, operations were ingenious and simple. For ascent, the pilot would ensure the louvers of the airplane were "open" so as not to restrict airflow and the double propellers would be configured to push (down) for lift. After ascending to the desired altitude, the configuration of the propellers was adjusted to push in the opposite direction while the louvers in the airplane were adjusted to an angle so as the craft descended, a slight horizontal component of motion was imparted. Thus, as the craft descended, it was also displaced horizontally. At a safe, low altitude, the louvers would be opened, and the propellers adjusted to provide lift and the pilot would propel his way back to altitude. Figure 12. Photo credit: Public domain. 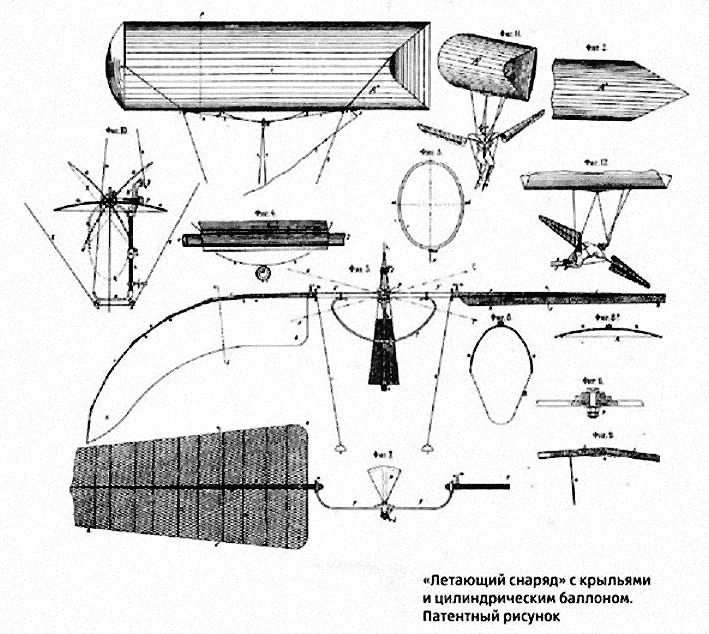 Danilewsky's book "A Steerable Flying Apparatus", 1900, pg 26. In the illustration, above, the solid line represents the flight path in still air. The pilot drives the craft vertically to the desired altitude, with the airplane louvers fully opened. Upon ceasing operating the propellers for ascent, the pilot then adjusts the louvers to an angle, and sets the propellers to direct their thrust downward for the purpose of accelerating the decent. As the craft rapidly descends, the airplane louvers impart a horizontal component of motion. At the lowest desired altitude, upon setting the propellers again for ascent, the louvers are adjusted to an angle to favor the desired continued horizontal component, and the pilot drives the propellers once again to ascend. Thus, in still air, the craft is maneuvered, at will, in the desired direction of flight. On the other hand, against light wind, the flight path is represented by the dashed line. The flight path is essentially the same except that the wind imparts a component of drift opposite the desired direction of motion. All other aspects, the actions of the pilot, and the settings of the propellers and airplane louvers remain the same. The most significant impact of a (light) wind is that it takes more ascent/descent cycles to travel the same distance. 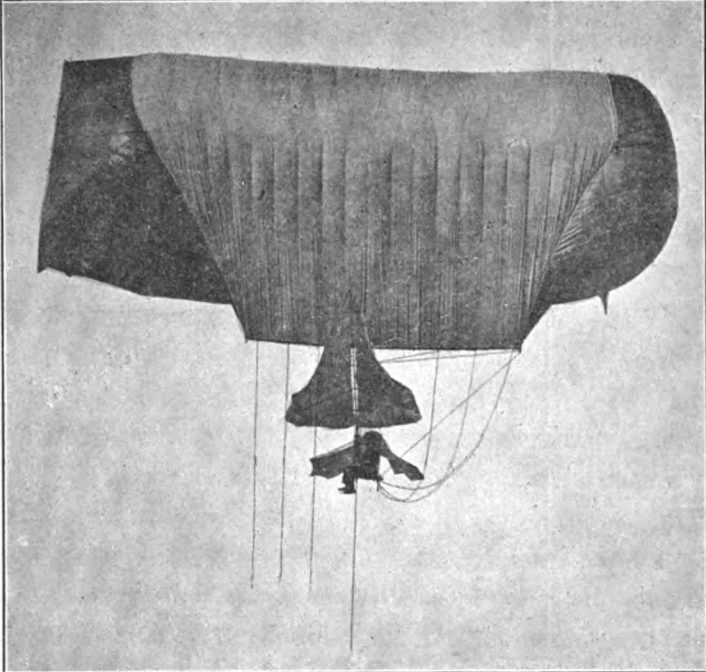 In actual test flights of the 1899, since Danilewsky was forced to use an earlier balloon, not designed for vertical operation, and the decent, even in still air, was most certainly hindered as the lower-end of the balloon must have acted as an additional parachute-like resistance. Nevertheless Danilewsky writes of success and setbacks in a series of flights in September and October, 1899 - experiences typical for this sort of developmental program. The concept was proven, though not made practical, much to the dismay of Dr. Danilewsky. Here is one extremely interesting Danilewsky concept I think is worth making note of. Since the pilot was causing the airship to travel horizontally quite unpredictably, and it was not possible to have "ground crew" waiting for the pilot's final descent, upon descent the pilot would extend his feet from his pedals, permitting his feet to first contact the ground! "The feet of the aeronaut," Danilewsky writes, "in this case, play the role of a spring." Further, if the pilot desired to stay on the ground, in the next moment after touching-down, he would screw into the ground a specially adapted drill! The pilot then, with the craft anchored, was then free to exit the craft without a ground crew present! Compare this technique to that of the European Space Agency robotic "Philae" spacecraft which attempted to land on comet 67P/Churyumov–Gerasimenko on 12 November 2014. Philae had "anchor harpoons" which were supposed to secure the spacecraft to the comet moments after the spacecraft contacted the comets' surface. The harpoons did not work and the tiny spacecraft rebounded off the comet. Perhaps Danilewsky's method should have been evaluated by the European Space Agency's Philae team! Danilewsky's ideas were nothing short of brilliant. 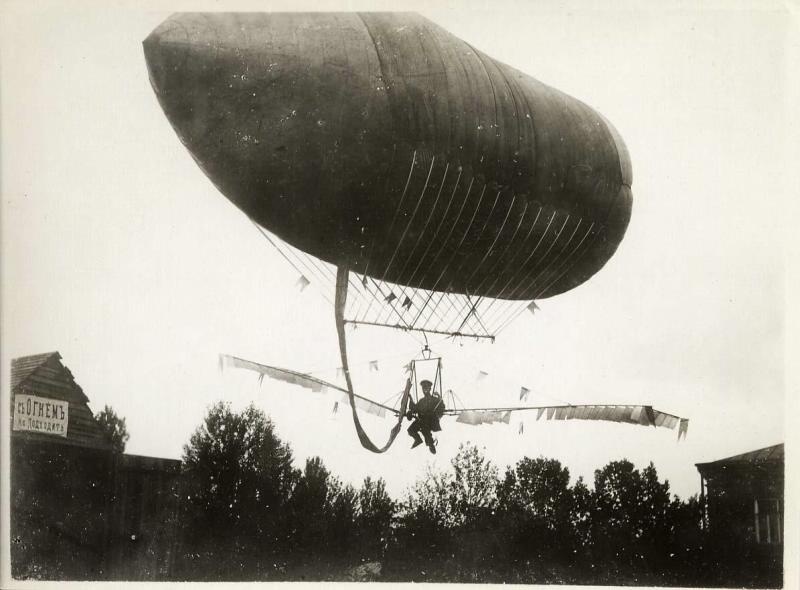 While he fully recognized that his efforts were "premature" in terms of resulting in a practical airship for common travel since a gasoline engine light enough to mount on an airframe suspended from a balloon was not available in his time, he knew that this concept of flight could still be examined and tested using human power. In this goal, he succeeded even though, as fate would have it, the rest of the world had "moved on", collectively fantasizing about the efforts of world-wide experiments with heavier-than-air flight and with the effort of several nations to build large, fully dirigible airships powered by engines of which the engine's weight was not such a hindrance because the balloon itself was large enough to compensate and against which no individual could hope to compete. The press was unkind to Danilewsky, unjustly in my opinion. He was invited to speak to the aeronautical subsection of the Tenth Congress of Naturalists and Physicians in Kiev in August, 1898. Danilewsky reports that his report "went almost unnoticed". Aviation journalists were most unkind making statements that Danilewsky's work "offered nothing new to aviation". Sometime in the period 1898-1899, Danilewsky's only benefactor, A. A. Pilström, had died. 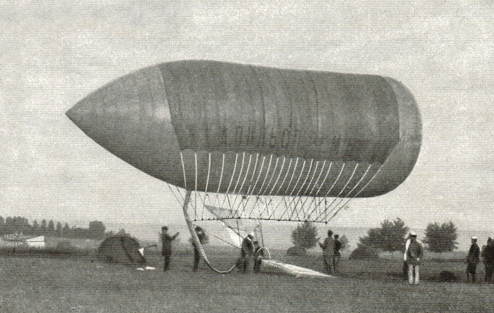 By summer of 1899, Danilewsky had exhausted his many appeals for new benefactors, and having ordered the envelope late for his 1899 vertical airship, the balloon arriving late for summer testing and which failed to meet his specifications, thanks to the apparent inattention by the Lachambre brothers, he was forced to test, as summer ended, using the envelope of the Pilström and Orichka gas-envelopes. Upon completion of his (rather successful) tests in October that final year, funds exhausted, Danilewsky had to "throw in the towel" so-to-speak. Danilewsky wrote, likely with his detractors in mind: "Stubborn people who recognize only a complete solution to the problem of flying a man will wait long for their winged Pegasus; but there are others, more practical, who will be content with what is now at hand. These people, with unshakable hands vigorously tackling the matter, with thousands of experiments over several years will develop manned flight to the sublime solution and will bring aircraft to perfection."